The Very Low Frequency (VLF) band is located in the frequency range between 3KHz and 30KHz. This band has the unique characteristic of having a portion fall within the audio frequency range of our ears. What’s more, the bulk of a lightning strikes energy is deposited between 2KHz and 10KHz. These two points form the basis for everything which follows.So how does one go about building a VLF receiver anyway? You might be surprised to find out that it is not very difficult to build one. In it’s simplest form (and not so simple forms) a VLF receiver is nothing more than an audio amplifier attached to an antenna. 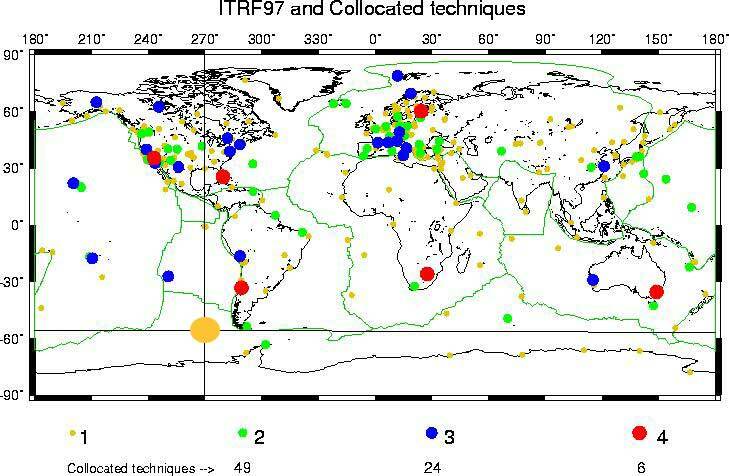 One of the most popular uses for a VLF receiver is for listening to lightning strikes from around the world, and the interesting effects that this activity has on our atmosphere. The snap, crackle, and pop sounds from lightning activity which one can hear on a VLF receiver, or AM and short wave radio for that matter are called atmospherics or spherics for short. These are the most common sounds heard on the VLF band and can be heard 24 hours a day. Spherics show up as wide band bursts when plotted on a spectrogram. This is because a lightning strike is not a narrow band event as is say a military VLF transmitter like NAA in Cutler Maine at 24KHz. These types of wide band signals are characteristic of natural EMF activity from Earth as well as our solar system and beyond. So it shouldn’t surprise anyone that another name for this hobby is “natural radio”. I have been interested in natural radio for a good ten years now. Over the years I have built a number of VLF receivers of the E-field and loop antenna type. As a matter of fact the Schumann resonance receiver which I use, found here, can easily be modified to receive the entire VLF band. I’m currently using a homemade receiver for this project which I detail below. Another option is the VLF-3 from the Inspire Project. The Inspire Project is a NASA sponsored (among others) project involved with interactive NASA space physics ionosphere radio experiments. They are doing very interesting stuff. The VLF-3 kit which they provide is of very good quality and easy enough for just about anyone to build in a few quiet nights in the radio shack. I recommend this receiver for anyone interested in getting into this hobby. That is if you don’t want to build your own receiver. Ok, you might be asking yourself what’s the big deal about popping sounds from lightning in the VLF band anyway. Yes I agree, after a short while spherics can get very boring. Thankfully, there is more to natural radio than just spherics. During dusk, dawn and the intervening night hours the ionosphere goes through a transformation that has a profound effect on spheric activity. At dusk the D layer (lowest layer) of the ionosphere fades away leaving the higher E and F layer only. This is due to the lack of ionizing radiation from the Sun during the night hours. This phenomena can easily be seen on a SID receiver plot as a sharp rise in the received signal strength of a monitored VLF transmitter at dusk and the subsequent signal drop at dawn. During the daylight hours spherics can travel upwards of 2000 to 3000 kilometers from the source of the lightning strike. These spherics reach the receiver via the wave guide created by the D layer and the Earth’s surface. At night though it’s presumably the much higher E and F layers that are responsible for the sky wave component of a VLF signal. This allows VLF signals to travel considerably further at night. During the night hours, spherics from much further than 2000 or 3000 kilometers can be heard! As a matter of fact during night hours it is possible to hear spherics from clear across the planet. These types of spherics are called tweeks. Tweeks get their name from the distinctive “tweek” sound they produce. They can easily be distinguished from normal spherics just by their ringing sound alone. On a spectrogram tweeks generate a small tail at around 2KHz and it’s harmonics. It is this “tail” that gives tweeks their unique sound. Here’s an example of a tweek with a very long tail captured with my setup. Tweeks are spherics that have traveled for many thousands of kilometers through the Earth-ionosphere wave guide, and because of this they undergo dispersion. Dispersion is the process of higher frequencies arriving at the receiver slightly faster than lower frequencies. The lower frequencies only lag by a few hundredths of a second, but this is enough to change how a spheric sounds at great distances. Dispersion is associated with the cut-off frequency of a wave guide. All wave guides have a cut-off frequency and the Earth-ionosphere wave guide’s cut-off frequency is around 1.7KHz. This is why we see tweek tails at this base frequency range. I say “range” because the Earth’s wave guide varies with the reflecting height of the ionosphere. There is a nice paper that goes into more detail about tweeks, dispersion and cut-off frequencies in the Earth-ionosphere wave guide with formulas and all, and it can be found here. Dispersion plays a very important role in natural radio and there is another phenomena that takes dispersion to the extreme, whistlers. Whistlers are less common than spherics and tweeks, but are truly worth the effort of detecting them. 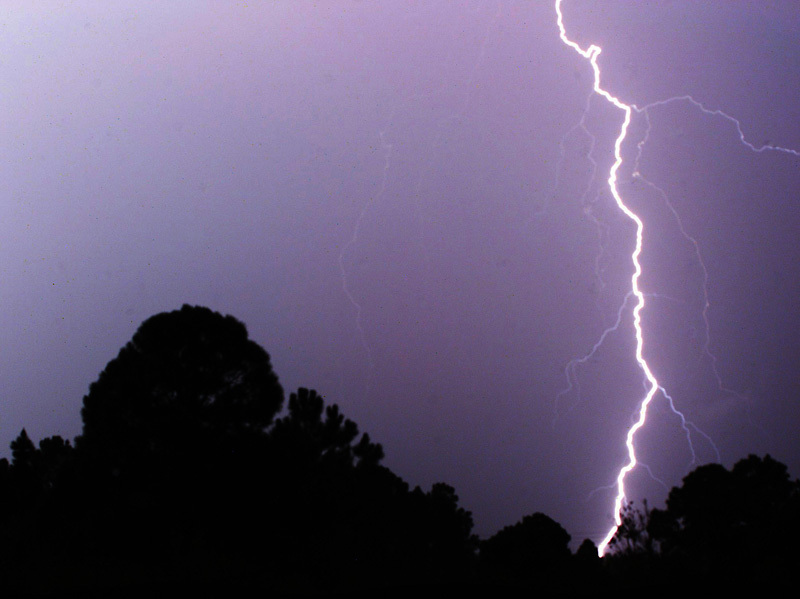 Whistlers are associated with intense lightning strikes, and research has shown that they might be linked to upward electrical discharges from thunderstorm tops. These types of lighting are a hot subject in the scientific community today, so VLF receivers are on the cutting edge of science! The theory goes (highly simplified) that energy from intense lightning strikes can get coupled into the magnetosphere through the ionosphere, and this energy then becomes trapped inside magnetic field lines within the magnetosphere. As the trapped energy/electrons travel up the magnetic field line they are guided back down to the magnetic conjugate point on the opposite hemisphere. A VLF receiver in the opposite conjugate point will hear a steady decreasing tone that last for about one second. The whistler energy has literally traveled thousands of kilometers into space, many times further than the circumference of the Earth to generate such an extreme dispersion in the signal. It’s also possible for the whistler to be reflected again back up the magnetic field line by the ionosphere and be heard at the originating conjugate point as a whistler echo. These whistler echoes normally last two to three seconds! This is the link between natural radio and space physics and the reason why I feel that natural radio has a place in this astronomy web site. If you would like to calculate the magnetic conjugate point for your location go here: IGRF/DGRF Model Parameters and Corrected Geomagnetic Coordinates at SPDF. Now to the project itself! After initial tests with the homemade receiver in the radio shack I realized that for serious natural radio monitoring the receiver most be placed outside and away from a homes electrical wiring. The power grid 60Hz hum and its harmonics are just horrendous inside a home. 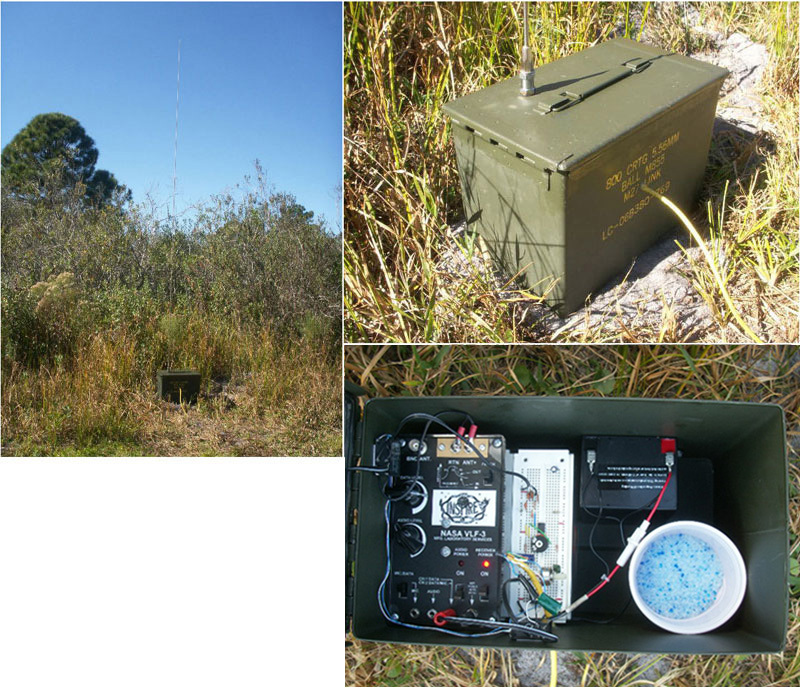 Therefore, I used a military ammo box for the outdoor enclosure to house the receiver and a 12 volt rechargeable battery for powering the receiver. The ammo box has a rubber seal around the cover that does a great job at keeping humidity out. I used a long run of CAT5 network cable between the house and the receiver. 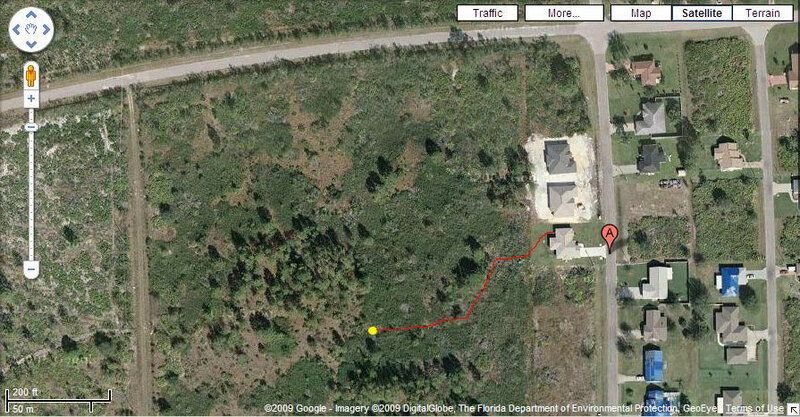 The receiver is located about 500 feet away from the house. Here’s a Google Earth view of where I installed my receiver. The yellow dot is where the receiver is located and the red line is the feed line. On either end of the cable run I installed a 1:1 isolation transformer to isolate the receiver from the house and to balance the feed line. This is an important step and shouldn’t be omitted! After all, the whole point of putting the receiver outside is for isolating it from the house’s electrical systems. I used an 8 foot CB steel whip antenna bolted to the ammo box for the antenna and two 8′ foot copper ground rods for the ground. An E-field receiver needs a good ground for proper operation so don’t cut corners here. A good ground system can cut down on the hum level so double your efforts here. I add desiccant inside the ammo box to keep the setup as dry as possible. Installing a receiver outside adds to the complexity of the installation, but for natural radio there isn’t much of an option. And remember, when it comes to natural radio it’s all about location, location, location. So search for the location that has the lowest hum level possible. 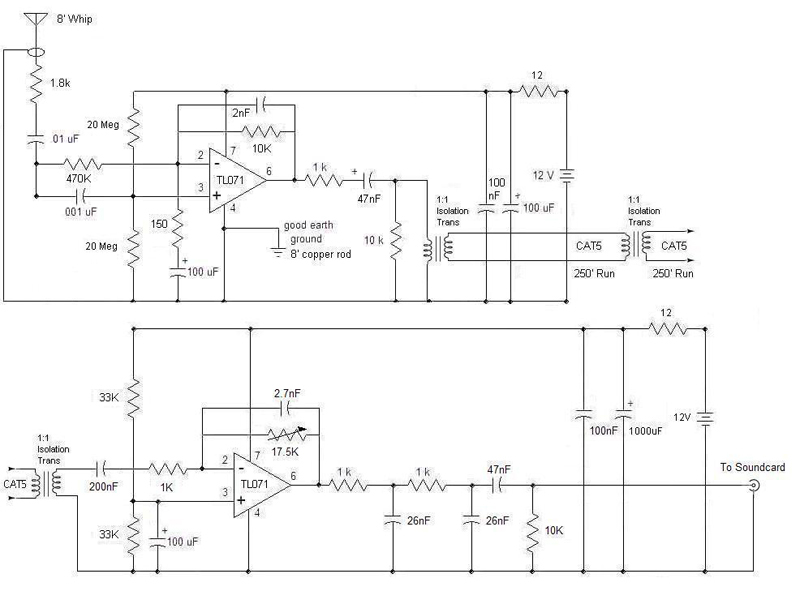 Here is the schematic for the outdoor receiver and the indoor gain and filter stage. All resistors are metal-film. I had to add a 1.8Kohm resistor in series with the antenna as well as looping the antenna cable around a ferrite bar to correct an “intermodulation” like issue I was having with a nearby broadcast FM station. In the house I have the second stage of gain and filtering built around a TL071. The gain of this stage is between one and seventeen which is set to give a total gain of x1000 whenever possible. Low pass and high pass filtering is important when designing a natural radio receiver because the goal is to have a full sounding receiver. Therefore the frequency response has to be tailored via filtering to achieve this. I would like to thank Paul Nicholson for his assistance in adjusting the parameters of these circuits. So what does the VLF band look like during a quiet day? Below is a spectrogram of what one can expect from a typical VLF receiver. In this spectrogram all the vertical lines are spherics and tweeks. The waterfall scroll interval was set a little to slow for the tweeks to be visually detectable in this plot. 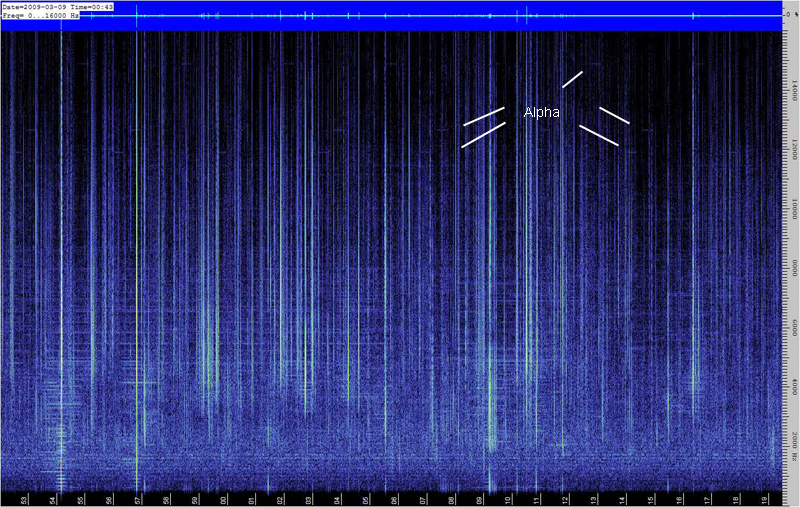 At 11.9KHz, 12.6KHz, and 14.8KHz there is a faint train of pulses from the Russian Alpha navigation system. The audio software I use is Spectrum Lab by DL4YHF and is a must have for natural radio! Don’t worry it’s free. Even with the receiver outside you need additional filtering of the 60Hz signal and its harmonics or you won’t see or hear much of anything except the power grid! This is of course unless you are fortunate enough to live in the middle of nowhere away from all civilization. 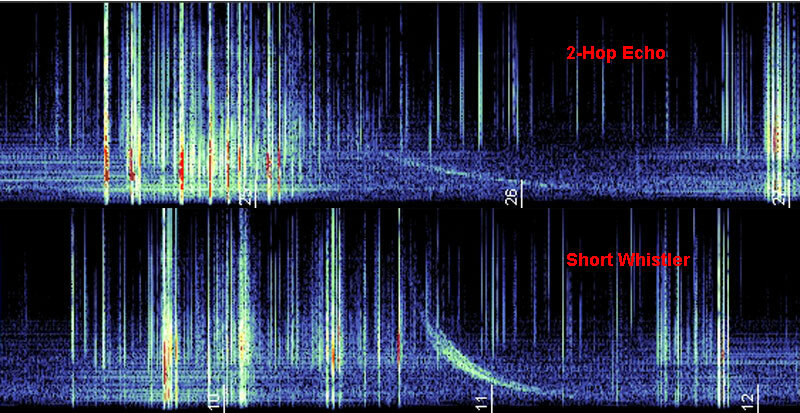 Here are three spectrograms of one hop whistlers captured with my setup on the night of March 7th 2009. This is what I was after when I set out to build a natural radio receiver so I’m very exited that I finally have a receiver that is sensitive and quiet enough to capture whistlers in Florida! In many cases the source spheric or tweek which generates the whistler can also be seen. For example the next spectrogram shows a tweek about half a second before the whistler. The dispersion time of the whistler categorizes it as a one hop whistler meaning that you would expect to possibly see a tweek preceding it if propagation conditions are favorable. Therefore, the tweek marked source originated in the South Pacific off the coast of Chile near the Arctic Circle, and it shows the dispersion one would expect to see for a spheric which has propagated via the Earth Ionosphere wave guide for thousands of kilometers. Some of that same energy was ducted into the Magnetosphere and arrived at my location via a magnetic field line(s), and this signal shows dispersion consistent with this mode of propagation (whistler mode). There’s a bit of ambiguity as to which of the two tweeks in the above spectrogram caused the whistler (if either…). In chapter 4 of Robert A. Helliwell’s book “Whistlers and Related Ionospheric Phenomena“, he details the steps used for identifying the sources of whistlers. The first method and most used when available is to compare several whistlers in the same run. If there are at least three whistlers to compare from the same run high reliability can be achieved just by using this method. Fortunately I had a number of other whistlers from this same run which I superimposed on top of each other in Photo Shop. I then aligned the whistlers and looked for causative impulses which aligned to within 1mm of each other. You’re looking for impulses within a second of the whistlers here (one hope whistler). In the case of the above whistler, the strong tweek to the left of the marked “source” tweek was just outside of the threshold while the weaker marked tweek fell within the 1mm range called for in the book. Therefore there is a good chance that the above marked tweek was the source of the whistler. When hunting for whistlers one should look for strong lightning activity some hundreds of miles away from your location as well as near your magnetic conjugate point. In the case of Florida, its conjugate point is off the coast of Chile. The orange circle on this map roughly shows Florida’s conjugate point. With two hop echoes the source spheric which causes the echo is normally always identifiable. In the above case the source spheric is one of the strong strokes just before the echo. With some practice one can predict which spherics will generate echoes! The dispersion times for one, two and subsequent whistler echoes depends on Latitude. For example, whistlers in Florida will always sound shorter than say whistlers in the UK. Regardless, single and echo whistlers can always be differentiated easily. Here is a comparison of a short whistler and a two hop echo. The dispersion time deference between the two is clearly evident. Both of these examples where from the same run on the 23rd of May 2009. Here are a few examples of rare whistler trains from Florida. This activity was recorded during a strong geomagnetic storm on March 3rd 2012. About twelve echoes can be counted on the spectrograms. Natural radio activity usually increases during geomagnetic activity. During solar storms whistler as well as chorus activity tends to increase greatly, particularly in the higher latitudes. Therefore, one should also keep track of solar weather when hunting for whistlers and the like. I also operate an ELF receiver which I use to detect the earth-ionosphere cavity resonance or as it’s better known, the Schumann resonance. Spherics and the Schumann resonance are intimately related. It is the hundred or so lightning strikes per second occurring around the globe which energize the earth-ionosphere cavity which in turn causes it to resonate like a tuning fork at it’s base resonant frequency. One can calculate the earth-ionosphere cavity resonance (highly simplified) by taking the speed of light (300,000 km) and dividing it by the circumference of the planet (40,000 km). The result of the division is 7.5Hz. The actual base mode of the Schumann resonance is at around 7.8Hz give or take .3Hz. Below is a spectrogram of the VLF range with a spectrogram slice of the ELF range superimposed showing the first three modes of the Schumann resonances. They are the three ripples below the 20Hz marker. The red lines point to where the Schumann resonance is located in relation to the towering wide band spheric activity. I find it fascinating that something like spherics which sound like little inconspicuous pops and crackles on a VLF receiver are actually pumping tremendous amounts of energy into our atmosphere and causing our very biosphere to ring at it’s resonant frequency. Just think about this for a minute. The fact that technology has reached a point that one can detect these phenomena with a simple electronic receiver, a computer and a soundcard is truly amazing. It is possible to use Spectrum Lab by DL4YHF to stream a live VLF stream so one can see the VLF sounds as well as hear them. Instructions on how to accomplish this using Spectrum Lab can be found here. My receiver along with a number of other natural radio receivers can be accessed here: http://abelian.org/vlf/. Have fun, and please email me if you have any questions or comments. great blog, thank you! I’m going to follow your schematics to build one, although as I aim to use it in the field with batteries as power supply and my laptop (on batteries too) I don’t really need a long cable between receiver and filter/amplifier so I have a question to you – should I just ignore the 1:1 isolation on both ends and put both receiver and filter/amplifier in the same box? If so, do I need two 12v separate power supply as you have? I’d appreciate your help as I don’t feel that comfortable with electronics. You’re correct, you can ignore the isolation transformers as they are used only if it’s a permanent setup. You should be able to run the entire receiver from a single 9 volt battery. You also don’t have to use the TL071. I’ve had a lot of success with the OP07 and OP27 as well. What you are looking for here is the most quiet OP amp possible for the front end. Another good design is to use a FET transistor as the front end. Good luck and have fun! Could you tell me the frequency range of the whistlers, please? I cannot see the scale on the graphs. Has anyone thought that the whistlers and tweeks are infact meteors and not lightning strikes? Timing is perfect! Whistlers span the same frequency range as lightning strikes do. So for natural radio purposes, it’s the audio frequency range of 1khz-16khz or so. Whistlers are lightning strikes that originate at the magnetic conjugate point for your location. Typically you will find a large storm in the South Pacific that is causing the whistlers you are hearing if you are in the US. I did a bit of work trying to correlate meteors and VLF emissions of any type some years back. I never recorded anything conclusive though. If you go over to the VLF Yahoo group you will find a lot of work done in this area. The snapping sound of tweeks often tends to occur at the precise time as meteors in my experience. This has more to do with coincidence than anything else in my and many others opinion though. Nonetheless, this is a very active area of research and I encourage you to jump in and start recording and looking up!